The set features a white leather passport holder and matching white leather luggage tag. 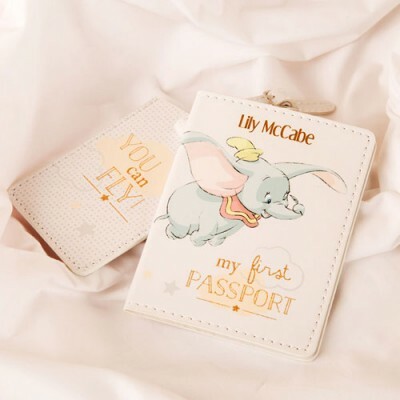 Decorated with the beloved Disney character Dumbo, the passport holder is picked out in peach and grey, with the phrase 'My First Passport' detailed in a glittery gold finish. Personalise the passport holder with the full name, to make this a truly magical gift for birthday's, Christenings or Christmas. The matching luggage tag features the iconic phrase 'You can fly!' over a grey poka dot background.